Nikko Toshogu Shrine is a Shinto shrine in Nikko, Tochigi Prefecture. 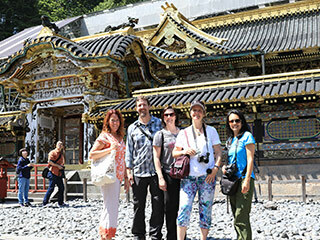 It is part of the "Shrines and Temples of Nikko," a UNESCO World Heritage Site. Toshogu is dedicated to and enshrines Tokugawa Ieyasu, the founder of the Tokugawa Government and the first Tokugawa Shogun. After his death, his son the second Shogun Hidetada, and his grandson the third Shogun Iemitsu built this shrine in 1617. Most of the shrine and it ’s structures are preserved in their original form and many of them are designated as National Treasures of Japan. Futarasan Shrine is the sacred and oldest shrine of Nikko, Tochigi prefecture. It enshrines Mt. Nantai. In 767, Priest Shudo climbed up Mt. Nantai and built a shrine on the top of the mountain. This is the origin of Futarasan Shrine. Since then, Mt. Nantai became the sacred mountain and zone of Shugendo place. The area of Futarasan Shrine consists all mountains of Nikko including Kegon Falls. This is 2nd largest Shrine, next to the grand shrine of Ise, in Japan. Today, people still worship here for spiritual experience and its respect. All of the building are registered as the important cultural and historical assets. Because of its historical value, it is designated as the UNESCO World Heritage Site. Taiyuin Temple is the grave and mausoleum of the 3rd Tokugawa Shogun Iemitsu. It is located in Nikko, Tochigi prefecture. It belong to Rinnoji temple. Taiyuin is one of the main feature of Nikko and designated as the UNESCO World Heritage Site. The buildings of Taiyuin are absolutely gorgeous with the best of the best arts. Taiyuin was constructed by Iemitsu's son, Ietsuna in 1653. They took the best architectures and design at Edo period. However, Iemitsu ordered to make all less scale or colorful than Toshogu, the grave of his grand-father Ieyasu. Therefore, comparing to Toshogu, Taiyuin shows the idea of Wabi, and harmony of art and nature. All the buildings are based on the black and gold design. His mausoleum is registered as the National Treasure of Japan. Kegon Waterfall is one of the best 100 waterfalls in Japan, and one of the three great falls in Nikko, and one of the three great waterfalls in Japan. Moreover, Kegon waterfall is the most famous waterfall in Japan. It is located Okunikko (奥日光) in Tochigi Prefecture. Kegon waterfall is 97m(326 ft.) high, and 7m width. Water come from Lake Chuzenji (中禅寺湖), and a mount of water falls 2 tons per second. It sometimes increases tremendously after heavy rain. It is a grand view of 97m straight fall.